runjoey: Training with Amy Part 4 or what's in it for me? Training with Amy Part 4 or what's in it for me? 2008 was a sub par year for me as I was in almost constant pain running. I had dnf'd couple of races and finally in December after running Derby I took 6 weeks off completely from running and cycling to finally heal. 2009 was a re-building year and I mostly swam and biked while slowly building up my running to do my Ironman at Coeur D Alene in June. 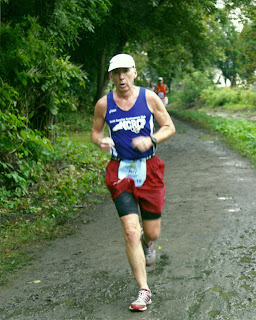 After that my goal was to get back into shape for a fast marathon so so that I could qualify for Boston in early 2010. I needed to get my qualifier so that I could go with Karla back to Boston and celebrate our 5th anniversary of that special day in 2006 when we ran together. I worked hard and got a 3:45:00 which just barely got me in since I needed at least 3:45:59 at that time. 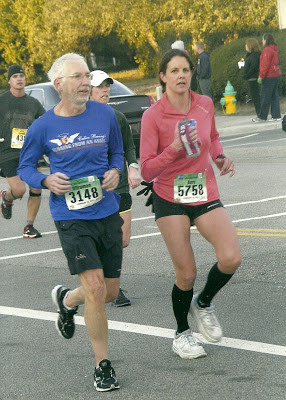 Later that year after more training which included the track work that we were doing when Amy joined us as I mention in a previous post, I ran the Lehigh Valley Marathon in Sept to try and get a faster time. I succeeded but just barely with a 3:44. I continued to train hard and focused on running a pr at Boston but for some reason I still don't understand I had a terrible day and my race was a flop from mile 6 and I never even got up to race pace. 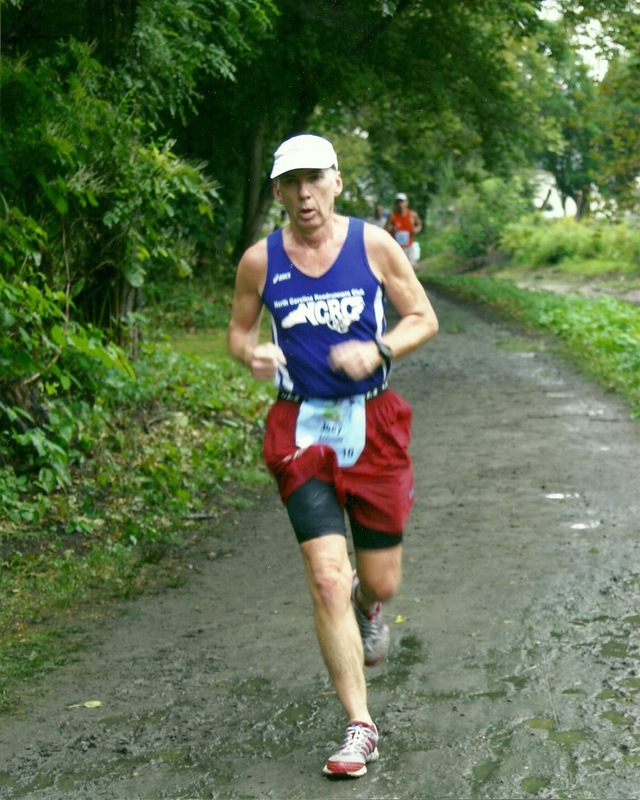 I was very disappointed with that and knowing how hard I had trained to qualify and just barely doing it, I was resigned to the fact that at my age I would never again approach my 2006 pr time. I spent the next couple of years focusing more on ultras again although not trying to do nearly as many as before. Just trying to have some quality runs. I was no longer doing much on the way of speed work and content to run easy most days. Yes, occasionally I would do a tempo run or maybe some mile repeats but never in an organized way with a goal to focus on. I figured just with good mileage and the occasional quick run I could get a 50 mile and 100 mile pr before I was too old. And then Amy tells me after Umstead that she wants to qualify for Boston. A quick look at the qualifying standards shows that we need the same time, a 3:39:59. 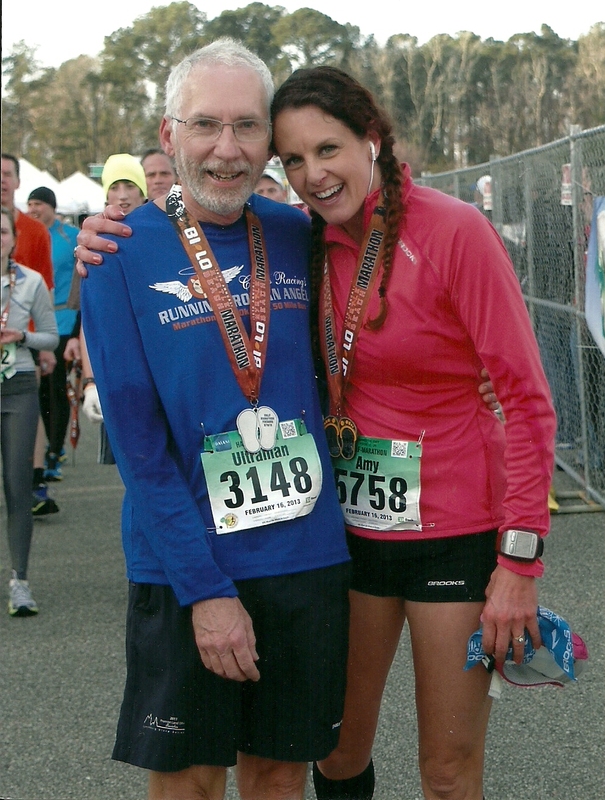 I had promised her I would get her there but in doing so I was going to have to run my second fastest marathon ever, 7 years after my pr and believe me when you are in your 50's , 7 years is a lot of difference. At first I had not planned on going and really thought I didn't have a chance of going anyway. I would just train her and plan on returning with Karla in 2016 when I could get in with a 3:55. As we began to get serious with the training and we were having so much fun with it I began to entertain thoughts of just maybe I could make it after all. 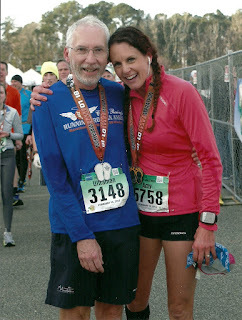 I have always enjoyed doing speed work and running fast and sharing the tough runs with Amy made me realize just how much I had been missing by not doing it regularly. It wasn't too long into the training that I knew I had to be all in. We were a team and we were going to go to Boston ! I still find it hard to believe how well I am running right now but the past 3 years have been my highest mileage years ever so I had a great base to build on. In addition to the running, last Fall I had decided I wanted to start back doing some core work and a little strength training. I had just been doing a little bit for a couple of weeks when Amy put down a 30 day plank challenge. That was more motivation and we actually went about 40 days on that before moving on. I have kept up the core and as soon as the planks were over I began my 100 pushups workouts and a couple of weeks later began the 200 situps challenge and began adding pullups and dips to my routine. Over all the last several months Amy has been going to Arrichion Hot yoga for yoga and circuit training and now I have been inspired to add yoga to my routine also for the past month or so. So, although I get a lot of happiness and satisfaction in seeing Amy come so far over the past few years we have known each other I want to say THANK YOU AMY !! Thank you for showing the toughness and spirit and love of running. Thanks for sharing the miles with me. Thank you for giving me a new goal and the inspiration I needed to dream big again. Thank you for pushing me harder than I would have ever pushed myself over these last 6 months and most of all, THANK YOU for your friendship !! Sometimes ya just got to take the race "by the scruff of the neck"! !Today my friend ya did just that . .3.52:52 CONGRATS,good things happen to those who persevere!! The Grande Experiment Two. Continues !